ARLIER THIS MONTH, I posted a blog entry encouraging the growth of chant scholas in prisons. Through working for a year in a county prison, I discovered that incarcerated men & women are very often starved for beauty. I see the potential of forming a schola among inmates not just as a nice thought, but as a practical idea (and work of mercy) worthy of our consideration. A family friend of mine is doing something similar, but different, in my hometown. Along with a couple of friends from the parish choir, she has organized the “Doylestown Comfort Choir,” which goes to sing at the bedside of the sick & elderly, especially hospice patients. Their purpose is to use the gift of music to bring about the fruit of peace in those who are struggling with ill health or facing death. Started almost 4 years ago, the Doylestown Comfort Choir now boasts nearly 30 members. 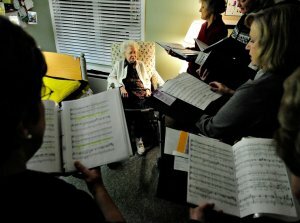 Practices are held once a month, and the members branch off into sub-choirs of 6 voices each when they get a call to go perform a “sing” for someone. They service four different nursing homes and a hospital. Most of the music they sing is SAB, including both spiritual music and popular music from the era of the patients’ childhood. The choir includes professional, semi-professional, and volunteer singers, all of whom leapt at the chance to serve when they were invited to be part of the Comfort Choir. The group was even featured in a local newspaper article a couple of years ago. We are so used to thinking about the work of sacred music in the context of the church building. There is something refreshing about ideas like this, which transform sacred music from a job into an apostolate and bring the humanizing effect of beauty to those who need it most.